I had an opportunity to meet and talk with Brent Higgins last spring as we were preparing an Easter lesson here at Student Life Bible Study. One of our writers was from BJ's church in Indianapolis, Indiana, and had written an activity that had to do with BJ, and the hope that he had in the resurrection. I was totally consumed because I realized that my oldest son and BJ would have been the same age, and my son was getting ready to embark on a summer missions project to Nepal. I had the most heart-warming experience in meeting and talking with Brent over the phone, seeking his permission to use BJ's story in our lesson. 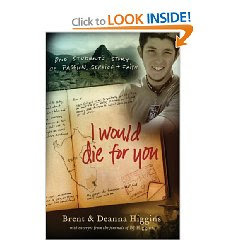 I found Brent to be a humble man with an incredible passion for Christ and reaching the world with the Gospel. I consider Brent to be a good friend. Later, after obtaining the book, "I Would Die For You," and downloading the song by MercyMe onto my ipod, I went off on a trip to Charlotte, NC, and managed to read the book while in route to and from. There were moments when I found myself weeping over portions of what BJ had written, and his commitment as well as the ordeal his family went through at his loss. What an incredible testimony love, commitment, passion for Christ, and passion for reaching the nations. Brent later sent complimentary copies to my boys before the one traveled to Nepal, and the other traveled that summer to Brazil. Both boys were moved at the life and testimony of this teenage boy. I know that it will greatly impact the lives of any who read of the life of this committed young man. Thanks for bringing it to the forefront, reminding us that this is truly what we're all about. "When Southern Baptists write petty, mean or un-Christian things about me or others I love, I think of BJ Higgins. When I am tempted to lose focus on what is really important, and catch myself getting caught up in the politics of a denomination, I think of BJ Higgins. BJ didn't talk about missions, he lived it. BJ wasn't concerned about his own legacy, he was captivated by Christ's legacy." I am sitting here crying as I read about BJ. It was not that long ago that I helped financially support the son of a Baptist friend, as he went on a mission to India, sponsored by his school: Liberty University. He was a little older than BJ when he went. He had all of his shots and still, he became seriously ill in India and nearly died. We all prayed. I even called the nuns and requested vigils so that someone would be praying for him each hour through the nights. My Baptist friend's faith was her solace and she was peaceful. Now he is planning to become a minister. His younger brother is planning to study medicine and is seeing his future as a medical missionary. God is merciful. "BJ" must stand for 'Beloved of Jesus". I will think of him that way as I read his story. God bless his family for ever and ever. Wade, thank you. Thank you for the gift of sharing this young man's story with us. Hmmm... sorry to see only 3 comments after 4 hours. I have seen mosts posts go from 0-50 or more in 4 hours - but those are usually controversial posts ripe for the picking from those that love to attack. Maybe Baptists don't recognize true Christianity when they see (or rather read about) it? I hope not... maybe it'll take off over the weekend. one to examine, his own heart, and commitment to missions. A lot of Christians were scared off by the last two posts. The tone of many contributions was muddled, some strident. Many attempts to offer a different format or a different point of view were not well received. Something about Calvinism is divisive, I wonder what? B.J. 's story will not attract the venom of those who are venomous. It will not attract the attention of those who fling the Bible at one another like it was a weapon. B.J. 's story is for Christians who need so badly to see a candle lit in the world. B.J. 's story is not for all those who merely curse the darkness. Perhaps it is a tribute that the simple beauty of this child's faith leaves so many speechless, removes the venom from the venomous, bring us to open our Bibles in reverence, and restores us all to the center of our faith: the Lord of Heaven and Earth, the Christ. in memory of what he did for the Lord. People can have un-named stars named formally, you know. The light shineth in the darkness . . . . The above blog is in honor of Brent Higgins Jr. Thank you. I will buy this book for my daughters to read. Have a great weekend. I agree with you anon... nothing to fight about in a good, heart-warming story that reminds you of what you once new: that your life is in God's hands and He wants you to use it up on Him. All the silly theological arguments people start really mean nothing at all to God. Christ is more interested in what we have done to carry our His will for our lives. I can't imagine standing before Him telling Him, "What? Your disappointed? But I defended the proper view of (fill in the blank here) against all those liberals and heathen for You!" It's sad to think that while that conversation will probably never take place (I think we'll all be speechless), many will have sorrow in their hearts for spending so much time arguing about silliness. and given hope, that if B.J. could fight the good fight, they, too, will make a difference. What can one individual do in this sad world to bring Christ's love? An explanation of the stanzas describing a soul's conduct along the spiritual road that leads to the perfect union with God through love, insofar as it is attainable in this life. A description also of the characteristics of one who has reached this perfection. In this book we will first cite the entire poem, then each stanza will be repeated separately and explained, and finally we will do the same thing with the individual verses. The first two stanzas describe the effects of the two kinds of spiritual purgation that take place in a person: one, a purification of the sensory part; the other, a purification of the spiritual part. The remaining six stanzas speak of some of the marvelous results obtained from spiritual illumination and union with God through love. Dark Night of the Soul (Spanish: La noche oscura de la alma) is a treatise written by Spanish poet and Roman Catholic mystic Saint John of the Cross. It has become an expression used to describe a phase in a person's spiritual life, a metaphor for a certain loneliness and desolation. It is referenced by spiritual traditions throughout the world. The Dark Night of the Soul is divided into two books that reflect the two phases of the dark night. The first is a purification of the senses. The second and more intense of the two stages is that of the spirit, which is the less common of the two. Dark Night of the Soul further describes the ten steps on the ladder of mystical love, previously described by Saint Thomas Aquinas and in part by Aristotle. The text was written while John of the Cross was imprisoned by his Carmelite brothers, who opposed his reformations to the Order. While this crisis is assured to be temporary in nature, it may be extended. The "dark night" of Saint Paul of the Cross in the 18th century lasted 45 years, from which he ultimately recovered. Mother Teresa of Calcutta, according to letters released in 2007, "may be the most extensive such case on record", lasting from 1948 almost up until her death in 1997, with only brief interludes of relief between . Franciscan Friar Father Benedict Groeschel, a friend of Mother Teresa for a large part of her life, claims that "the darkness left" towards the end of her life . The "dark night" might clinically or secularly be described as the letting go of one's ego as it holds back the psyche, thus making room for some form of transformation, perhaps in one's way of defining oneself or one's relationship to God. This interim period can be frightening, hence the perceived "darkness." No words exist for what is shared at that moment. No words are needed. I think you feel a connection with Christian tradition of mysticism. I notice that you sometimes refer to St. Theresa of Avila and St. John of the Cross. I never felt a connection to this tradition, myself, until I had a child who could not communicate verbally. My son did not speak in words. But we still had a connection! Don't ask me how. I learned volumnes from that child about the love of God and not a word was spoken. There exists spiritually something more than just what we all take for granted; and I have been privileged to glimpse it. L's: To me, True Christianity is when this happens ... "BJ understood that a man is not really ready to live until he is fully prepared to die at any moment." I sometimes feel like I am going through this "darkness". It's hard to describe, it's very much like all your frames of reference have been snatched away in life ... but you get closer to God that way. Also this paragraph from the above: The "dark night" might clinically or secularly be described as the letting go of one's ego as it holds back the psyche, thus making room for some form of transformation, perhaps in one's way of defining oneself or one's relationship to God. This interim period can be frightening, hence the perceived "darkness." The above seems to explain the purification that is experienced through despair, suffering, longing and abandonment. I do not know if these traditions are present in the baptists. For as long as eternity in heaven lasts, he will always have done what he did, for Jesus' sake. I don't think we can really imagine the eternal joy he will have, there. Far too many believers never really, and I mean REALLY, have to live by faith, IMO. I feel the blessed ones are the ones that do. Thanks for posting this! I had not heard about BJ. Now, I want to read the book. There are so many around the world being persecuted for the faith and giving their lives for the Gospel. It is a good thing for all of us to visit VOM and other persecution sites a few times a week to read these stories and pray for our brothers and sisters. "All the silly theological arguments people start really mean nothing at all to God. Christ is more interested in what we have done to carry our His will for our lives." And one of those things is to study the Word of God so that we can be workers for Christ, not ashamed by our lack of knowledge of the Word; deeply rooted in the principles and purposes behind the commands of Scripture. The Gospel IS the indicative. Only with a thorough knowledge can the imperative be seen. Our study of Scripture unleashes the power of the Spirit to take us into this Marvelous Light! I am going to bet on a good hunch that BJ knew this. Mission Trips and ministry in general have a way of getting us into the Word. 1. let us not consider theological debates to be trivial and contrary to the Work of Christ, but consider them (as Scripture does) as "iron sharpening iron." 2. Let us not come to the table of theological debate half-cocked or half-armed. The whole counsel of God must be our teacher. BJ followed the LIVING Word. The LIVING WORD does not need our debates with one another, He asks much more than that from us. I will not use BJ in any debate with any Christian about any disagreement with doctrine. I will ask myself instead to honor this young witness as a child of God, who trusted in his Father, and sought to serve in the Kingdom, even unto death. Let us ‘sharpen our iron’ elsewhere and , instead, sit quietly in the light of this child’s faith and at peace with one another. BJ’s story needs no debate. When we hear it , we stand in the presence of Something Sacred. The one's who want to run from discussing theology are the one's that have a weak theology. This is evidenced by their "cartoonish comments" as they ridicule something they have not even studied with venom and refuse to interact. Simply absurd and their theology will remain weak as long as they have that attitude. Their mama's hated the fact that God is sovereign, that's good enough for them and so they do as well. Don't confuse them with the bible. Let their mama's word rule. Sharpen your iron elsewhere? What a ridiculous thing to say. Now get back to the post and stop commenting on things you haven't studied and consequently know nothing about. This is one calvinists who is blessed to be serving overseas putting my weak faith into action as He enables me. Thank you Lord Jesus for blessing my life with this blessed story of my fellow co-laborer! I'm an honored. ...servant to know this family. Anon who says I have weak theology - the only weak people I see on this blog right now are those that attack others and don't sign their name. My son doesn't have any theology at all. He does not speak. He has never said the name of Jesus. He is able to walk and frequently helps others where he lives who are stretcher-bound. He lives at Eastern Christian Children's Retreat in Wyckoff N.N. in one of three group homes on the grounds of this magnificent facility. Their chaplain, who is of the Dutch Reformed Faith, has told me that my son's service to the others is his ministry to the rest of us. The chaplain says that, without any words spoken, my son is teaching us what it means to be Christian. I believe him. B.J. was only fifteen. What complex theology directed his steps? None. He didn't need it. He followed the Lord with all of his being and he did it in a way that we can ALL understand. I think maybe you have captured the essence - though I think this 15 year old probably had more theology under his belt than most of us would give him credit for (and most of us have ourselves in reality), it remains that he grasped the most important part of a STRONG theology - that we are to be wholly and unreservedly committed to Him - and by extension - His will. None these arguments - and note I say arguments, not debates, arguments that include condescending arrogance, are helpful. It is one thing for iron to sharpen iron. I agree with that. But it's another thing to pretend that the attack mentality of many falls within the context of that passage is simply wrong. Let's not forget that in His great discourse of the Sermon on the Mount, he spoke of the meek inheriting the earth, the poor in spirit inheriting the Kingdom, the peacemakers as Sons of God, etc. Those that attack don't fit any of those descriptions. Actually Alan, that comment was not directed toward you. I think I understood what your points were above and I don't have a problem with them. However, since you brought it up, I think I stand in a long line of people who are growing weary of those who are more concerened with who someone is instead of the content of what they say. But there will always be those who get a pride refill by calling someone else a coward all the while ignoring their biblical points of interaction. My comment was directed to those who have a weak theology. Who is that you ask? Well, they are clearly recognizable by their comments on this thread and the last couple as well. More importantly, they know who they are. My point was it is a sign of weak theology if someone doesn't want to interact with scripture, but they would rather enter the stream, spew venom, reveal their ignorance on a certain topic (in this case, God's sovereignty), and all the while not even address anything that has to do with the post. So my plea is for them to forget about talking about something they no nothing about (i.e. the sovereignty of God in the salvation of His children) and enjoy this awesome post on this family that has impacted me and my ministry in a blessed way. who wrote: "let us not consider theological debates to be trivial and contrary to the Work of Christ"
Here is some theology for you to discuss. This will keep you busy. Enjoy. Manichaeism, a Persian dualistic philosophy proclaimed by Mani (216-276? AD) in southern Babylonia (Iraq) that taught a doctrine of "total depravity" and the claim that they were the "elect." Seems to be a connection, don't you think? Manichaeism did influence many who believed in the totally depravity of mankind. Was Mani, who developed Manichaeism, influenced by any Christian scriptures? ANONYMOUS who wrote: "My point was it is a sign of weak theology if someone doesn't want to interact with scripture"
or de-bunk it using the Bible. 1. God made Adam and Eve. He put them into Paradise: Eden. 2. God placed the tree of the Knowledge of Good and Evil in Eden. 3. God allowed the Serpent ‘Satan’ to enter Eden. 4. God had created Adam and Eve to eat the forbidden fruit. 5. God had predestined Adam and Eve to eat the forbidden fruit. 7. Adam and Eve never had any power to decide for themselves whether to sin or not. God had already decided for them. was not a THREAT , it was a PROMISE. 9. GOD IS IN CONTROL. If elected, we do nothing to earn salvation. If we are not ‘elected’, we can do nothing to earn salvation. 10. Therefore, God has predetermined our fate. We have no power over it, one way or the other. SINCE ADAM AND EVE HAD NO POWER OVER WHAT THEY WOULD DO, IT WAS GOD WHO CHOSE THAT THEY WOULD SIN. THEY ARE INNOCENT OF ANY CHOICE BECAUSE THEY HAD NO CHOICE. IT WAS GOD’S WILL. GOD ENGINEERED THE FALL OF MANKIND, USING ADAM AS HIS PREDESTINED INSTRUMENT. God planned and controlled EVERYTHING according to His Will because He is sovereign over ALL creation. What does the Bible say about numbers 1 through 10 ? What an awesome story!! May I be willing to let the Lord use me in anyway he can to reach others for Christ. I am nobody, but I beg that there be a truce of fighting on this blog and we honor the memory of this young man. a personal attack on another. We shall see if this works. Jesus had humility, This did not make Him a nobody. Far from it. The 'nobodies' out there are calling OTHER people nobodies or worse. Since you are not doing that, then you are not a 'nobody'. What does 'the Bible say'? 1. Is God ALONE responsible for everything to do with Salvation? 2. Did God abolish the free co-operation of the will of man in gaining Salvation? 3. Does mankind have the freedom of will to choose God? 4. Does mankind have the freedom of will to NOT choose God? 5. Does God, then, force mankind to sin, having removed all decision-making power from mankind? Is the person who is not elected NOT REALLY FREE TO SIN? 6. If a person is not really FREE TO CHOOSE TO SIN, then the one responsible for that Sin is not the person, but GOD who made them that way. then, God IS responsible for all salvation and all damnation. The non-elected person cannot be blamed for sinning, if he never had any control or freedom over whether or not to sin. WHAT DOES THE BIBLE SAY ????? Can we please, please get back to the subject of this blog? A young man died sharing the Gospel. Out of respect for him let's honor him and his accomplishments through Christ in only a few years of earthly life. Thanks for mentioning B.J. 's story. B.J. was in our home in Peru the year before his final mission. He was a great kid and took my youngest son under his wing and showed him the drama moves. It amazed me how B.J. touched the lives of the Peruvians. When he was ill, they prayed and fasted and when he died, it was as the death of a member of the local congregation. We really appreciate the work of AweStar, both evangelistically and in building the character of their missionaries. May God keep on blessing them and calling people out to take B.J. 's place. To those who can weather reading BJ's struggles at the hospital, his family recorded in the blog of BJ's honor, several times per day to show BJ's recovery and struggles with the infections. Please scroll to the bottom, since the blog entries are sorted by dates in descending order. I am very proud of his struggles in the hospital. He is very fortunate to have a loving family. And most of all to have a Loving God, Our Lord Jesus Christ as his Saviour. It was very hard to go through the blog entries and comments. But such is life. Without faith, love and struggles where would we be?. Without Our Lord Jesus Christ who is the Only Hope, where would we be? If anyone wishes to see photos of BJ, they are on BJ's blog, here and here. "The main theme God showed me was obedience: The disciples had to obey and follow though they were skeptical. Mary came immediatelywhen Jesus called her. Martha didn't obey Jesus right away, but argued about rolling the stone away. Lazarus , though he was dead obeyed Jesus and came out. If even the dead, wind, and waves obey Him immediately, we should also. I trust we can each continue to learn through the ministry of our Jesus!" In L's comments, of the BJ's quotes, most of the above quotes were pulled from BJ's journal. So they were penned by BJ as he read the Bible. Wow! He was still 15yo, when he died. Just 5 days short of his 16th birthday. The only significant thing I did when I was 15 yo, was to go on Adventure Mountaineering Course for 4 weeks in the Himalayas in India. It was cold for me, coming from South India, where it's fairly hot and warm. It was a secular Mountaineering course held in December. I struggled and found it to be a spiritual course (through my struggles) for me. At least for me, at 15 yo, you are almost grown up. At least in your own mind. You can perceive the world as it is. Time is so fleeting. Youth is only yesterday, and then we are no more. I second the motion to ignore the remarks someone is making who clearly has a hatred against the Doctrines of Grace and desires to take the attention off of this great story and this great family. The blog host holds to the Doctrines of Grace and he is able to ignore this "theologian" (haha), so surely we all can as well. Let's keep the focus on the young man and this remarkable family. Wow! Can't wait to get the book. I seem to be making too many comments here. Honestly, I am in the "Proud, Unbroken People" section more often than in the "Broken People" section. Realistically, we all move amongst the sections, in different times and situations. I wonder how BJ would rate himself? If others rated him, they would probably put him in the "Broken People" section. But if he were to do it, my guess is, he would say he was in the "Proud, Unbroken People" section. We all have to wait how Our Lord Jesus Christ would say in which section we belong to. Is the un-elected man given the choice NOT to sin? in freedom so as to personally make moral decisions. not morally responsible for what occurs. If a man is not free to follow his own conscience, he cannot be held accountable for making or not making moral decisions. Anony - You've done it. Your arguments against the Doctrines of Grace have been so profound, so biblical and so penetrating that we are all stumped and have no rebuttal. We all now subscribe to the view that you are espousing. You have won us over. Entirely and without question. Now, since that is settled, what do you think about the post? Did you know the Huggins before this post? Has this post caused you to think about missions differently? Do you have any similar stories you can share? Are you interested in the book? If the Baptists have anything similar to St. Teresa of Avila, or St. John of the Cross, I never found them. (I was an active Baptist for over 30 years). At least some people with similar theology are uncomfortable with even the idea of mysticism. I suspect that many of us are reading this posting, but have little to comment about it. Somehow, just saying thank you, doesn't seem comment worthy. The fullness of your bliss, I feel-I feel it all. A six-years' Darling of a pygmy size! X. Then sing, ye Birds, sing, sing a joyous song! I have no access to Baptist writings other than what has been referenced on this blog. But, Baptists are members of the Body of Christ, and so may share in all that is part of that. The Baptists that I have known are loving, gentle souls who 'LIVE' their faith. I have no doubt that their spirits were blessed by communion with the Holy Spirit in ways mystical in the sense that they have been given that peace that is beyond all understanding. We see the divisions we have made in the Church: our various denominations. From space, astronauts look down on the Earth, and see one Earth. They CANNOT see the borders Man has created to separate 'us' from 'them'. THESE MAN-MADE BOUNDARIES ARE INVISIBLE TO THE ASTRONAUTS. OUR MAN-MADE DIVISIONS ARE INVISIBLE TO GOD. Divisions among mankind are man-made. God has a way of seeing us differently, I think. He will bring good out of bad, and He can do that. Anna, that blessed child B.J. was Baptist, but he could have given sermons in our Church with no problem. He was speaking of the Kingdom of God, of the Body of Christ. Pure Christianity: without borders, without fences, without the divisions we so focus on in our blindness. BJ focused on Our Lord. He pointed to Our Lord. He followed the Lord without any holding back. He knew the great secrets of the Kingdom without any trouble at all. P.S. With B.J. 's writings, I think the Baptists have a spokesperson that speaks to ALL Christians. In centuries to come,our descendants may read the illuminating writings of this blessed child , as they read St. Theresa's and those of St. John of the Cross. So may it be. THAT WHICH WAS LOST . . . Thank you for B.J. 's testimony in confirmation of the Gospel. GOD SO LOVED THE WORLD . . .
2. The trend toward Calvinism and a mistrust of personal Christian experience. Thank God that BJ never adhered to these changes. If he had, he might not have felt the need to answer Christ's call and to personally respond in service to the Lord. For those that serve the Lord, the Words and Actions of Jesus in the Bible will always be at the center of their faith. as you walk at peace in His Presence. The rabbis gathered and discussed where the Messiah could be found. A messenger came running in to their presence to announce that the Messiah was sitting surrounded by the lepers outside the gates of the city, and there He was caring for the sick and the poor. 'Ah, said the rabbis, then THAT is the place where He most wants to be. Let us go there 'outside the gates' so that we may be with Him." The above story is adapted from Jewish tradition. I wonder if BJ ever heard this story or one like it? BJ traveled to a place he thought was important to the Lord, 'outside the gates'. I am just now realizing that the bible is "clearly" full of "mistakes"! Jesus said, "You did not choose me, but I chose you." I guess Jesus didn't yet see the gospel as presented in the 20th and 21st centuries. Jesus said, "All that the Father has given to me shall come to me." Jesus forgot the ending there. He meant to finish it by saying "...as long as they follow their glorious free will." "He has chosen us in Him before the foundation of the world." (Wonder why Paul left out the end of that verse? Of course, we all know in the greek it actually reads "He has chosen us in Him before the foundation of the world because He looked down through time and saw the elect's "good work" of choosing Him first. Way to go dudes! Sayeth the Lord." "There is no one who does good,no not one." Wow, I am really seeing tons of "mistakes" in the bible now. Jesus was supposed to say here that "There is no one who does good, well except those who do the ultimate good of using their glorious free will and choosing me! The ones that do that are awesome! Great job you guys! Sayeth the Lord"
Yet another boo boo! Didn't He mean to say "Jacob have I loved, but Esau have I loved a little less."? Really kind of a bummer for Esau. I mean, after all, in John 3 Jesus said He loved the world. Oh, I know. Maybe He meant He loved the world, just more in some places than others? "So then it depends not on human will or exertion, but on God, who has mercy." Hmmmm. These two are really tough ones. Let's just say that Jesus was kidding with these two verses. Yes, Jesus. You can do whatever you want with Your creation. But only if we (your creation) give You permission to do so. We will get back with you. Just hang in there. So many more examples. But I just have to stop. This could take the rest of my life to "fix" scripture so that it doesn't conflict with my tradition. Allah Predestines the Fate of Every Soul. Islam also teaches that there is one true God, not many deities. Guess we should believe in multiple gods because we all know Islam is wrong about everything, huh? Now I know what it means to be free. 1 ... لَوْ كُنْتُ أَتَكَلَّمُ بِلُغَاتِ النَّاسِ وَالْمَلاَئِكَةِ وَلَيْسَ عِنْدِي مَحَبَّةٌ، لَمَا كُنْتُ إِلاَّ نُحَاساً يَطِنُّ وَصَنْجاً يَرِنُّ! 2 وَلَوْ كَانَتْ لِي مَوْهِبَةُ النُّبُوءَةِ، وَكُنْتُ عَالِماً بِجَمِيعِ الأَسْرَارِ وَالْعِلْمِ كُلِّهِ، وَكَانَ عِنْدِي الإِيمَانُ كُلُّهُ حَتَّى أَنْقُلَ الْجِبَالَ، وَلَيْسَ عِنْدِي مَحَبَّةٌ، فَلَسْتُ شَيْئاً! 3 وَلَوْ قَدَّمْتُ أَمْوَالِي كُلَّهَا لِلإِطْعَامِ، وَسَلَّمْتُ جَسَدِي لأُحْرَقَ، وَلَيْسَ عِنْدِي مَحَبَّةٌ، لَمَا كُنْتُ أَنْتَفِعُ شَيْئاً. 4 الْمَحَبَّةُ تَصْبِرُ طَوِيلاً؛ وَهِيَ لَطِيفَةٌ. الْمَحَبَّةُ لاَ تَحْسُدُ. الْمَحَبَّةُ لاَ تَتَفَاخَرُ وَلاَ تَتَكَبَّرُ. 5 لاَ تَتَصَرَّفُ بِغَيْرِ لِيَاقَةٍ، وَلاَ تَسْعَى إِلَى مَصْلَحَتِهَا الْخَاصَّةِ. لاَ تُسْتَفَزُّ سَرِيعاً، وَلاَ تَنْسُبُ الشَّرَّ لأَحَدٍ. 6 لاَ تَفْرَحُ بِالظُّلْمِ، بَلْ تَفْرَحُ بِالْحَقِّ. 7 إِنَّهَا تَسْتُرُ كُلَّ شَيْءٍ، وَتُصَدِّقُ كُلَّ شَيْءٍ، وَتَرْجُو كُلَّ شَيْءٍ، وَتَتَحَمَّلُ كُلَّ شَيْءٍ. 8 الْمَحَبَّةُ لاَ تَزُولُ أَبَداً. أَمَّا مَوَاهِبُ النُّبُوآتِ فَسَتُزَالُ، وَمَوَاهِبُ اللُّغَاتِ سَتَنْقَطِعُ، وَالْمَعْرِفَةُ سَتُزَالُ. 9 فَإِنَّ مَعْرِفَتَنَا جُزْئِيَّةٌ وَنُبُوءَتَنَا جُزْئِيَّةٌ. 10 وَلَكِنْ، عِنْدَمَا يَأْتِي مَا هُوَ كَامِلٌ، يُزَالُ مَا هُوَ جُزْئِيٌّ. 11 فَلَمَّا كُنْتُ طِفْلاً، كُنْتُ أَتَكَلَّمُ كَالطِّفْلِ، وَأَشْعُرُ كَالطِّفْلِ، وَأُفَكِّرُ كَالطِّفْلِ. وَلَكِنْ، لَمَّا صِرْتُ رَجُلاً، أَبْطَلْتُ مَا يَخُصُّ الطِّفْلَ. 12 وَنَحْنُ الآنَ نَنْظُرُ إِلَى الأُمُورِ مِنْ خِلاَلِ زُجَاجٍ قَاتِمٍ فَنَرَاهَا بِغُمُوضٍ. إِلاَّ أَنَّنَا سَنَرَاهَا أَخِيراً مُوَاجَهَةً. الآنَ، أَعْرِفُ مَعْرِفَةً جُزْئِيَّةً. وَلَكِنِّي، عِنْدَئِذٍ، سَأَعْرِفُ مِثْلَمَا عُرِفْتُ. 13 أَمَّا الآنَ، فَهذِهِ الثَّلاَثَةُ بَاقِيَةٌ: الإِيمَانُ، وَالرَّجَاءُ، وَالْمَحَبَّةُ. وَلَكِنَّ أَعْظَمَهَا هِيَ الْمَحَبَّةُ! When through Your own death I live?" Like twins separated at birth, Humility and Wisdom always know the other is there somewhere. Humility and Wisdom go together and can never be separated. I wonder how many missionaries among the 77 (who were fired ) were as inspired and inspiring as BJ ? What happens to the spirit and the soul of an individual who prevents a missionary from reaching others for Jesus? Or maybe, they thought: "we don't have to worry about ANYONE. If God has elected them for salvation, then they don't need a missionary. I'm beginning to understand, thanks to the very thorough instruction from Calvinists on the last post. I had NO IDEA how ANYONE could treat missionaries so badly. Thank God BJ WAS given a chance to serve. He will have reached millions when his story is told. I think in his lifetime, BJ used all those 'talents' he received from the Lord. What a beautiful soul! "Islam also teaches that there is one true God, not many deities. Guess we should believe in multiple gods because we all know Islam is wrong about everything, huh?" الْمَحَبَّةُ تَصْبِرُ طَوِيلاً؛ وَهِيَ لَطِيفَ. الْمَحَبَّةُ لاَ تَحْسُدُ. الْمَحَبَّةُ لاَ تَتَفَاخَرُ وَلاَ تَتَكَبَّرُ. لاَ تَتَصَرَّفُ بِغَيْرِ لِيَاقَةٍ، وَلاَ تَسْعَى إِلَى مَصْلَحَتِهَا الْخَاصَّةِ. لاَ تُسْتَفَزُّ سَرِيعاً، وَلاَ تَنْسُبُ الشَّرَّ لأَحَدٍ. huh? I can post non-sequiturs, too. The power of scripture works again. It has revealed the anony as a muslim. Hey anony, were you forced to sign the MFandM (Muslim Faith and Message) or did you have a "choice"? Universal reconciliation, also called universal salvation or sometimes simply universalism, is the Christian doctrine or belief that all will receive salvation due to the love and mercy of God. This is the main belief that distinguishes Christian Universalism from other forms of Christianity. Universal reconciliation states that all people will eventually experience salvation, and most forms of the doctrine assert that the suffering and crucifixion of Jesus Christ is the mechanism that provides reconciliation for all humankind and atonement for all sins. This concept is distinct from Unitarian Universalism. Universal reconciliation is intimately related with the problem of Hell. There are various beliefs and views concerning the process or state of salvation, but all universalists conclude that it ultimately ends in the reconciliation and salvation of all mankind. The belief in the eventual salvation of all humankind has been a topic of debate throughout the history of the Christian faith. In the early Church, universalism was a flourishing theological doctrine. Over time, as Christian theology experienced growth and expansion, it lost much of its popular acceptance. Today, most Christian denominations reject the doctrine of universal reconciliation. Various theologians, including Clement of Alexandria and Origen in the 3rd century, St. Gregory of Nyssa in the 4th century, and St. Isaac the Syrian in the 7th century, expressed universalist positions in early Christianity. Though Gregory of Nyssa was a known universalist, he was never condemned. Modern universalists claim that universalism was the primary doctrine of the church until it was forcibly stamped out by the Catholic Church in the sixth century. Four of the six theological schools of thought in ancient Christendom supported universalism, and only one supported eternal damnation. Additionally, theological thought appears more varied before the strong influence of Augustine, who forcefully denied universal salvation. Some claim Augustine's rejection of the doctrine of Universalism was an unwarranted side-effect of Platonist pagan philosophy, rather than a conclusion based on his study of the Scriptures. In Western Christian belief, damnation to hell is the punishment of God for persons who were sinners. In Eastern Christian traditions (Eastern Orthodoxy and Oriental Orthodoxy), as well as some Western traditions, it is seen as a state of separation from God, a state into which all humans are born but against which Christ is the "Mediator" and "Great Physician". Deanna and I greatly appreciate you sharing about BJ. It truly has been a faith journey, and we have been blessed to see the Lord use his testimony to impact people around the world. He had an uncommon understanding of the deep things of God at an early age, and sought to share them with others at every opportunity. His own walk with Christ was inspirational, and humbling at the same time. As a parent, you never want or expect to lose your child. The Lord has blessed us as we have walked "through the valley of the shadow of death." He has been with us all the way, and has ministered to the depths of our brokeness. He has given us a stronger ability to minister to others through our own journey. We praise God for revealing Himself to us in such personal ways, and being so very real in the midst of the storm. It is our pleasure to carry the name of Christ, and the testimony of what He has done, to others, both here and overseas. Thank you Wade, for loving and serving our King! Thank you for taking a stand for Him, amid the torments in your life. We thank our Lord and Savior, Jesus Christ for you and your ministry!